This Religious Coin Token - St Michael the Archangel with Prayer can only be purchased in these bulk lots of 25 units at a discounted wholesale price, which is now available to the public. These discounted bulk packs offer the perfect solution if you want to give these Catholic goods away as gifts or to use as free envangelizing tools. Imported from Italy. 3/4 x 5/8-inch Gold-Filled (14K) St. Florian Medal, expertly crafted in the USA for a lifetime of use. This Religious Coin Token - Guardian Angel with Prayer can only be purchased in these bulk lots of 25 units at a discounted wholesale price, which is now available to the public. These discounted bulk packs offer the perfect solution if you want to give these Catholic goods away as gifts or to use as free envangelizing tools. Imported from Italy. This Religious Coin Token - Archangel Michael- can only be purchased in these bulk lots of 25 units at a discounted wholesale price, which is now available to the public. These discounted bulk packs offer the perfect solution if you want to give these Catholic goods away as gifts or to use as free envangelizing tools. Imported from Italy. This Finger Rosary-Silver can only be purchased in these bulk lots of 25 units at a discounted wholesale price, which is now available to the public. These discounted bulk packs offer the perfect solution if you want to give these Catholic goods away as gifts or to use as free envangelizing tools. Imported from Italy. This 18.5-inch Metal Angel Figure is part of our Holiday Elegance collection. This product ships the next business day. Manufactured by Roman, Inc. as part of their Christmas series of fine religious products. 1 1/4" Sterling Silver Celtic Crucifix with 20" Chain. This 1 1/4" Sterling Silver Celtic Crucifix with 20" Chain is made in the USA. Get 25 pieces for one low bulk price with our 25-Pack of St. Martha Novena Prayer Holy Card. Only available in this bulk pack. Novena to Saint Martha Clear, laminated Italian holy cards with Gold Accents. Features World Famous Fratelli-Bonella Artwork. 2.5" x 4.5" 25 Per Pack. Pope Francis Holy Card 2.5"x4.5" Paper Holy Cards (100 Per Pack). This Pope Francis Holy Card features the CatholicShop.com money-back guarantee. This Beautifully Illustrated "Pray the Rosary" 8 Page Pamphlet includes Joyful, Sorrowful, Luminous and Glorious Mysteries. Available individually for you to include with a rosary purchase or In bulk (sku #43848) to hand out to those who may need it. This 25-Pack - Religious Coin Token - St Michael the Archangel with Prayer has passed our quality control assessment and meets our strict criteria to be a Catholic Shop product. Buy with confidence. Catholic Shop aims to carry the finest products on the market. 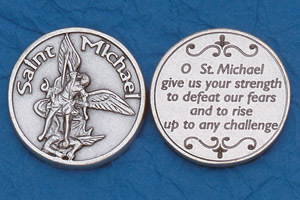 Our staff has inspected and tested this 25-Pack - Religious Coin Token - St Michael the Archangel with Prayer and found it to be worthy of our Satisfaction Guarantee.